win Saturday night at All American Speedway in Roseville, Calif.
Eighteen-year-old Gracin Raz executed a last-lap pass Saturday night at All American Speedway to score his first career win. Starting third on a green-white-checkered finish, the teen powered his No. 27 Montana Tech Ford past Chris Eggleston on the first lap and Alex Schutte on the final lap. The late caution pushed the 'oyota/NAPA Auto Parts 150 presented by Axle Crutch' to 152 laps. Heading into the season finale at Phoenix International Raceway on Thursday, Nov. 12, Eggleson leads Gragson by four points and Raz by nine. Patridge dropped a spot to fourth, 12 points out of the lead. K&N Pro Series West race at All American Speedway in Roseville, Calif. 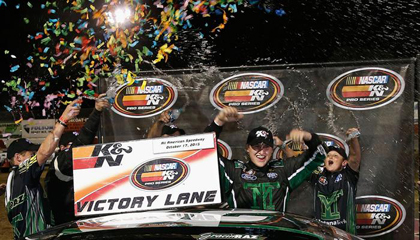 The Toyota/NAPA Auto Parts 150 will air on NBCSN on Thursday, October 22 at 7 p.m. ET.